I’d love you to meet my friend Katni. She’s our local guide in the tiny traditional village of Senaru, Lombok Indonesia. Katni is a practicer of the traditional religion of Wetu Telu – literally ‘three times’ in Sasak language. 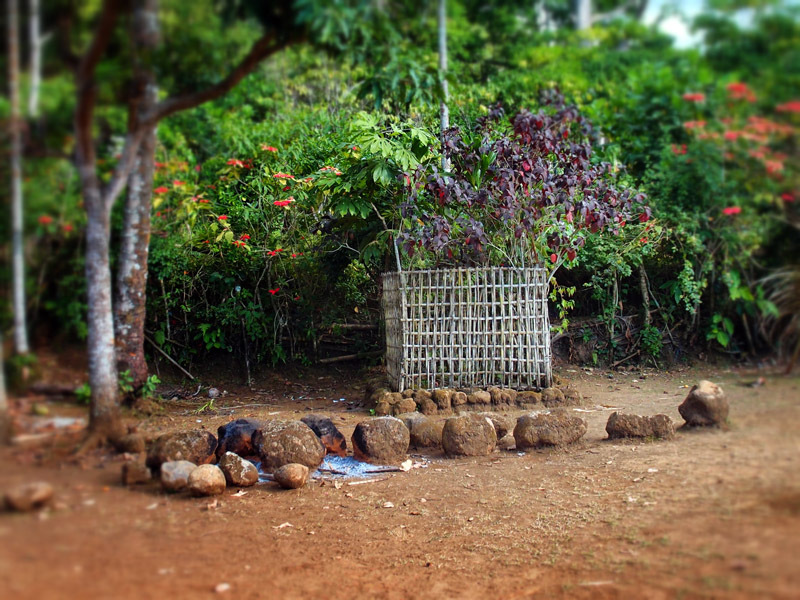 Wetu Telu practitioners are nominally Muslim, but their practices follow more animist beliefs. 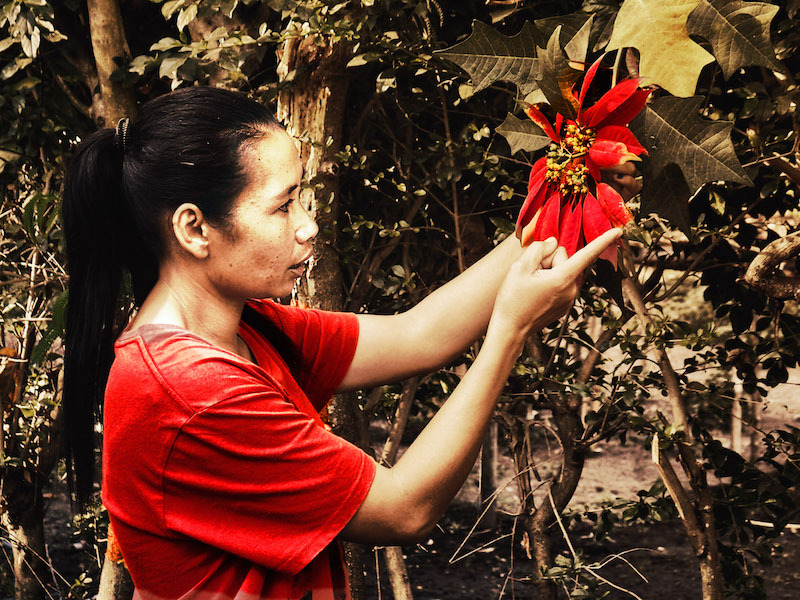 In the predominately patriarchal societies in Indonesia, it’s unusual to find a female guide. Katni has establish a women’s guiding association in her village. She explains that when the men in her village work, they give a little of their income to their families to live on, but keep a good percentage for cigarettes, alcohol, and “going to bars to watch woman to dance”; but when women are the breadwinners, all of their income goes to support their families, their children’s education and the community. Katni says she loves sharing her culture and educating younger girls, giving them the confidence to also do this. Today we have a couple of young trainees tagging along. They are very shy and mostly just observe. Katni was the first female guide in her village, and was criticised when she began “doing a man’s job”; but nowadays she has mothers asking if their daughters can be trained by her, as they can see the positive impact she has made. There are now forty female guides in the association. It’s during Ramadan on the day of our visit, but Katni is not fasting. “Only the religious leaders fast here, and they only fast for three days during Ramadan – on the first day, in the middle and the last day.” One of the young trainees wears a headscarf, and seems a little uncomfortable with some of Katni’s explanations. She explains that some here are learning how to do things “properly”, and that she is fasting, and prays five times a day. We move into the village and notice how clean it is compared to outside. There is no plastic laying about the neat rows of bamboo and thatch houses. The newer houses have cement foundations, but Katni says that causes problems with rheumatism for the older folk. 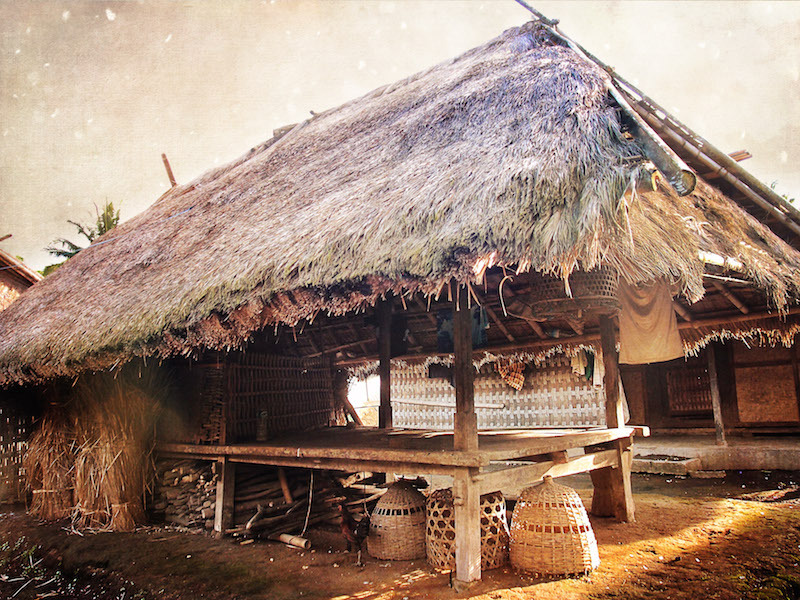 The more traditional houses have floors made of mud and cow dung. She slides open a woven bamboo door revealing a large smokey, light filtered room. The doorway is very low, and we must bend down to enter. It’s low for Katni too. She says they are deliberately low to show respect as we enter. Dust motes float on the light beams, that squeeze in thought the bamboo cracks. There are no windows. As our eyes grow accustom to the dimness, we can make out a small room and platform towards the ceiling with a ladder leading up to it. “That’s not a room for sleeping.” says Katni, “That’s were we put our offerings. We sleep on these two beds, or mats on the floor. The bed near the door is for the parents, the small bed on the far corner of the room is for the girls. That’s so they don’t go out at night and meet their boyfriends. We are several families living together in this one big room, so we mostly sleep on the floor ‘like rabbits’. This other platform at the moment is just for storage, but its true function is the honeymoon bed. When a couple are married in our tradition, they don’t go away on honeymoon like you do, the woman moves into the man’s home, and they sleep on this bed, surrounded by all the extended family. Yes, they just sleep.” she winks, “We know it’s their honeymoon, so we leave them alone during the daytime.” she winks again. The walls and ceiling are blacked from the cooking smoke of the open fireplace in the corner as there is no chimney. She explains that she loves leaning from others too, as well as sharing her own culture. She says that she’s learnt that the smokey atmosphere of the homes can be detrimental to babies sensitive lungs and eyes, and she now encourages mothers in the village to make hammocks outside during the day for the babies, so they aren’t exposed to smoke. We move outside again, and Katni shows us the beluga, a roofed bamboo platform with many functions. This is the place where young men sleep, the guest room, the meeting room, and the place were rituals are performed. It’s divided into two sections – a place for “life rituals”, and “death rituals”. One beluga is shared between two homes, except the head family – as they are a noble family, they have one. “My mother gave birth to fourteen children on this platform – no doctors or hospital, just a local midwife. We surround it with leaves to give the mothers some privacy. I also had my tooth filling here.” I am familiar with the tooth filing, as it’s a custom performed in Hindu Bali. It’s a similar ritual here, but is performed as part of the wedding ceremony. “You are lucky, you get a ring on your wedding day – we get pain.” she says, dragging an imaginary file across her mouth. She says it still hurts when she eats hot or cold food. We continue through the village and Katni points out a very young mother – She’s fifteen, and has two children. “I hope by empowering girls in the village, and improving education, there will be less young mothers, its too young”. Later she points out a newlywed couple, the girl has just left primary school, and the boy is not much older. The young girl already looks tired. Katni shakes her head. Katni then stops by an old woman with the telltale reddened mouth of a betel nut chewer. She shows my group the Areca nut “pinang”, the betel leaf “sirih”, and a small bag of slaked lime, made from crushed coral. Betel nut is a mild, but addictive stimulant widely chewed in South East Asia. Here in Senaru village they also mix it with tobacco to give it an extra kick. Katni explains with the widening eyes of someone also addicted, that here in the village you chew it before breakfast to start your day. She rolls a wad and offers it around. I berate her for pushing drugs to my group, winking as I do so. 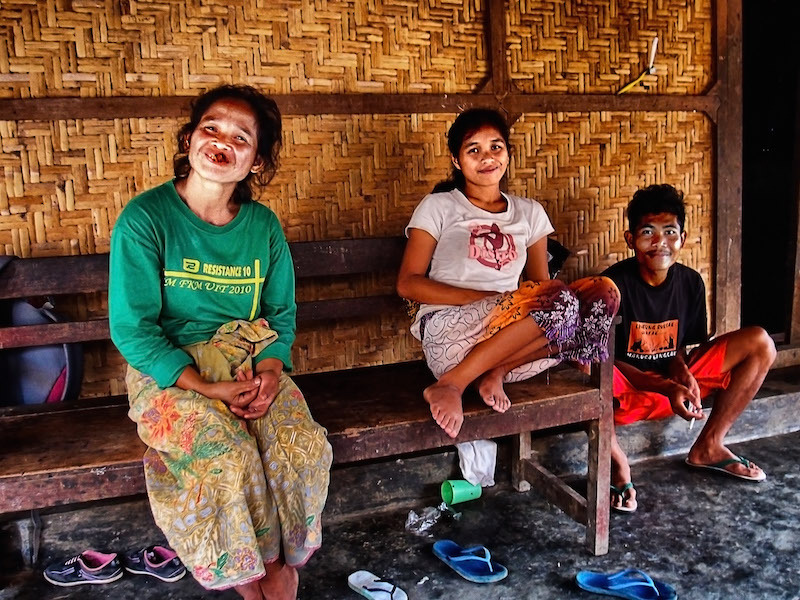 I mention some of betel nut’s negative aspects for long term users, including the serious risk of mouth cancer. I hope she will take this information and pass it around the village, but habits can be hard to change. Katni Showes my group a traditional ‘calander’. 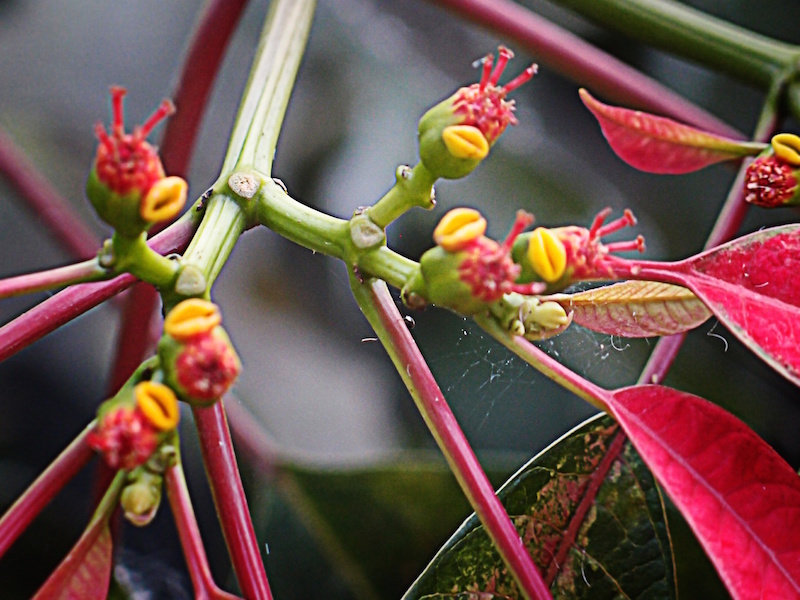 Continuing into the garden, Katni shows us a poinsettia plant. “This is our calendar. When the flowers are green, its the wet season, when they are red it’s the dry season. If there’s still a bit of the other colour we know we have a few weeks to go. We plant and harvest our crops according to this. “When I was little these was my dolls.” she says pointing to the inmost of the flowers – they look like little people with big mouths. We are then shown many other plants and are offered a taste of cocoa fruit, turmeric and ginger roots, among others. The light begins to fade, and soon the muddy path opens again to the asphalted road. We are transported back to the modern world. Katni thanks us for supporting her village and says that some of her guiding fee will be used to further train girls and support her village. We leave with positive hopes for their future, that Katni’s charm and good humour will encourage her community to take only the good things from our modern mixed up world. Thanks for your comments Mon. Yes, Wetu Telu is more animist than Muslim in my limited opinion, but agree – that’s not the point. She’s doing wonderful things for her community, regardles of what label she gives her beliefs. Reblogged this on Genesis of Tomorrow. Thank you for reblogging – that’s the first time one of my stories has been reblogged! Thoroughly enjoyed that Sally! We visited Senaru when we drove round Lombok a couple of years ago and would have loved to have had a guide, it would have made the village come alive for us. Next time! Thanks Jan – Yes, I’d reccomend another trip with Katni! Beautiful story and photos Sally. Makes perfect sense that nature would provide all the necessary ingredients for a “calendar”! 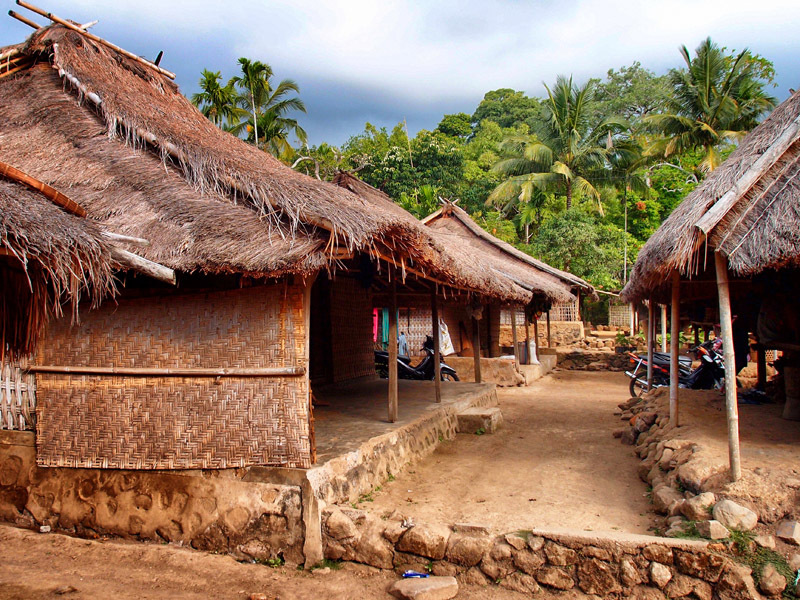 Would love to visit this village (and many other places) in Lombok and beyond. Thanks Amit. There are indeed many treasures in this vast diverse land!